You can click to visit our special Sponsorship page and support us by sponsoring your Aquaworld favourite! Aquaworld has never received a penny of public money. In fact, the aquarium is required to pay taxes into the Greek system and officials have consistently informed us that neither European nor local funding is available to build or improve an aquarium here on Crete. As such, all running costs and the funds required to improve Aquaworld are provided by those who believe in what we are trying to achieve and by those who simply love the animals we have in our care. Should you wish to contribute, click on the button below to make a donation using your Paypal account or your credit card. and then click on the 'Subscribe' button below. This will then be done safely and securely through PayPal. 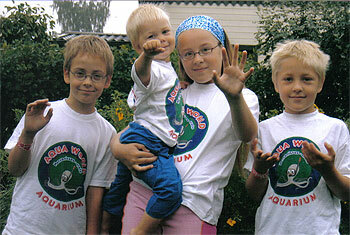 Aquaworld t-shirts are proudly displayed above by the Haume children of Nokia, Finland - regular visitors to the aquarium. T-shirts are priced at 10.00 Euro for children's sizes (2, 4, 6, 8, 10 & 12 year-old) or 15.00 Euro for adult sizes (small, medium, large, XL, XXL, XXXL). A postal charge of 3.00 Euro is added for orders under 50.00 Euro and 5.00 Euro for those over 50.00 Euro. Select the approximate age of the child from the drop-down menu, then click on the button below. You will be taken to a Paypal page where you can alter the number of t-shirts of that size you require in the first column. For additional t-shirts in different sizes, return to the Aquaworld web site, select a different size and click the button again. The new size will be added to your order. The second column on the Paypal page offers you the chance to remove items ordered by mistake. Select t-shirt size from the drop-down menu, then click on the button below. You will be taken to a Paypal page where you can alter the number of t-shirts of that size you require in the first column. When your order is complete, click on the "Secure Checkout" button on the Paypal page and pay for your t-shirts through your Paypal account or by credit card. Although tiny by comparison to other public aquaria, Aquaworld attracts and retains a strong following of supporters. Many of these are animal lovers, keen aquarists or reptile enthusiasts. Almost all are holiday makers here on Crete. Aquaworld is therefore actively seeking corporate sponsorship from companies involved with tourism in Greece, or from those who make and market aquarium and herpetological supplies. Sponsorship could be either in the form of direct financial support, or by means of providing equipment necessary to improve aquarium operations. For further details, please contact John McLaren. Of course, the simplest and best way to support Aquaworld is just to visit us every time you are in Crete. Our policy is to keep entrance prices as low as possible. Current charges have been in place since the introduction of the Euro - and we hope to keep them the same for as long as we can. This means that, as prices for the services and goods we need to run Aquaworld increase year by year, we need ever larger numbers of visitors to keep things ticking over. The good news is that this is happening - and this is of the utmost importance to the continuing well-being of the first aquarium open to the public in Crete.